Each week I chat with Matt Swaim on the Sonrise Morning Show about Bible foods and herbs. Keeping with December’s advent theme, today we chatted about St. Nicholas. I found the most interesting information on the whychristmas.com site and with just a teeny bit of editing, I’m sharing that information here. Do check out their site, it’s all about the history of Christmas and all that goes with it. St. Nicholas was a Bishop who lived in the fourth century in a place called Myra in Asia Minor (now called Turkey). He was a very rich man because his parents died when he was young and left him a lot of money. He was also a very kind man and had a reputation for helping the poor and giving secret giftsto people who needed it. There are several legends about St. Nicholas, although we don’t know if any of them are true! There was a poor man who had three daughters. The man was so poor that he did not have enough moneyfor a dowry, so his daughters couldn’t get married. (A dowry is a sum of money paid to the bridegroom by the brides parents on the wedding day. This still happens in some countries, even today.) One night, Nicholas secretly dropped a bag of gold down the chimney and into the house(This meant that the oldest daughter was then able to be married.). The bag fell into a stocking that had been hung by the fire to dry! This was repeated later with the second daughter. Finally, determined to discover the person who had given him the money, the father secretly hid by the fire every evening until he caught Nicholas dropping in a bag of gold. Nicholas begged the man to not tell anyone what he had done, because he did not want to bring attention to himself. But soon the news got out and when anyone received a secret gift, it was thought that maybe it was from Nicholas. 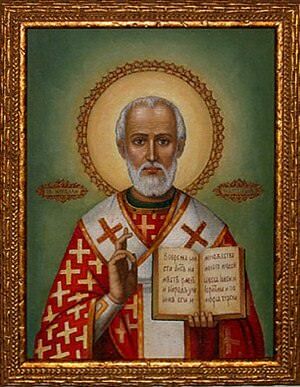 St. Nicholas was exiled from Myra and later put in prison during the persecution by the Emperor Diocletian. No one is really knows when he died, but it was on 6th December in either 345 or 352. In 1087, his bones were stolen from Turkey by some Italianmerchant sailors. The bones are now kept in the Church named after him in the Italian port of Bari. On St. Nicholas feast day (6th December), the sailors of Bari still carry his statue from the Cathedral out to sea, so that he can bless the waters and so give them safe voyages throughout the year. In some countries including parts of Austriaand Germany, present giver became the ‘Christkind’ a golden-haired baby, with wings, who symbolizes the new born baby Jesus. In the early USAhis name was ‘Kris Kringle’ (from the Christkind). 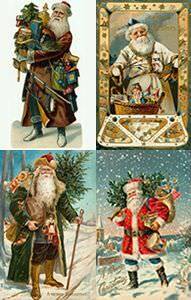 Later, Dutch settlers in the USA took the old stories of St. Nicholas with them and Kris Kringle and St Nicholas became ‘Sinterklaas’ or as we now say ‘Santa Claus’! In 1823 the famous poem ‘A Visit from St. Nicholas’ or ‘T’was the Night before Christmas’, was published. Dr Clement Clarke Moore later claimed that he had written it for his children. (Some scholars now believe that it was actually written by Henry Livingston, Jr., who was a distant relative of Dr Moore’s wife.) The poem describes St. Nicholas with eight reindeer and gives them their names. They became really well known in the song ‘Rudolph the Red nosed Reindeer’, written in 1949. Do you know all eight names? Were all the reindeer female? Did you know that Rudolph and Santa’s other reindeers might well be all girls!? Only female reindeer keep their antlers throughout winter. By Christmas time most males have discarded their antlers and are saving their energy ready to grow a new pair in the spring. 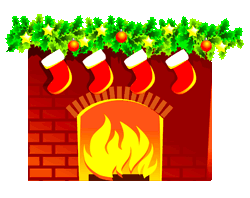 Most children receive their presents on Christmas Eve night or early Christmas morning, but in some countries they get their presents on St. Nicholas’ Eve, December 5th. St. Nicholas putting the bag of gold into a stocking is probably where the custom of having a tangerine or satsuma at the bottom of your Christmas stocking came from. If people couldn’t afford gold, some golden fruit was a good replacement – and until the last 50 years these were quite unusual fruits and so still special! We put a pomegranate in each sock at our house, a tradition that started in my Lebanese family 3 generations ago! Check out the fun advent/holiday edible craft – peppermint candy trays, ornaments and bowls!